11 years ago last month, my Mother was diagnosed with Amyotrophic Lateral Sclerosis (ALS), also known as Lou Gehrig’s disease. Her first noticeable symptom affected her balance and mobility and appeared at least 10 months earlier. Thus began a long, difficult journey to proper diagnosis during which her symptoms increased in number and severity. The road to an ALS diagnosis is a lengthy, stressful process of elimination comprising numerous tests, exams and procedures. ALS received much attention in the media recently thanks to the ice bucket challenges. Those challenges not only helped raise awareness of ALS but also over $115 million in donations to the ALS Association. Amazing! To date, there is no cure for ALS. GingerPeach is on a journey similar to my Mother’s, though I had no idea at the start this would be the case. GP’s first noticeable symptom affected her balance and mobility and appeared about 11 months ago. Initial suspicions included arthritis, increased ataxia due to the anti-seizure medications for her epilepsy, and several other ailments. Muscle wasting and weight loss were also present. As of last month after many tests, exams, and increasing symptoms, GP is believed to have Degenerative Myelopathy (DM). I say “believed” because, at this time, confirmation of a DM diagnosis can only be made post-mortem. Similar to ALS, the road to a DM diagnosis is a lengthy process of elimination. Also like ALS, there is no cure for DM. Prognoses for these diseases are not good ones. Difficult but true. Mean survival time for patients with ALS is 3-5 years. For dogs, the clinical course for DM can range from 6 to 12 months before the dog is paraplegic. ALS and DM cause degeneration of motor neurons resulting in weakness and muscle atrophy. Both diseases result in progressive paralysis, often to the stage of quadriplegia. Death is usually caused by respiratory failure, though most dogs with DM are euthanized before those final stages. The similarities between ALS and DM do not stop there. In 2009 paper published in PNAS, researchers with the University of Missouri at Columbia and the Broad Institute show DM and ALS are genetically related and share mutation in the SOD1 gene. This finding brought the two diseases together and opened many doors for researchers working toward treatments to benefit people and dogs. More on the molecular biology, genetics and research in a future post. I was surprised to learn the connection between ALS and DM, but also found the information empowering. When I learned DM is essentially Canine ALS, I immediately felt better prepared to assist GingerPeach. I am well-acquainted with ALS, not only the progression of the disease but also the care-giving involved. The month after my Mother’s diagnosis I moved to Arkansas to be with and assist her and my Father. A decision made the moment I learned her diagnosis. That’s how I came to be on Plumwood with Piglet and Angels Ethyl, Fox & Geronimo, the Original Plumwood Posse. My Mother passed away in 2004. I feel her absence but also her presence. I am thankful for the time we shared. She was a beautiful, creative, resilient, truly amazing person who taught me many things. She continued to teach me during her journey with ALS, which she traveled with her trademark courage, strength, love of life, and grace. She continues to inspire, teach and help me even now. GingerPeach is also beautiful and resilient and teaches me many things. She has lived with drug resistant Canine Epilepsy for the past 10 years with courage, strength, love of life, and grace. She does the same as she faces DM. This is a difficult period for GP, the Posse and me with 4 of them between the ages of 12 and 15. 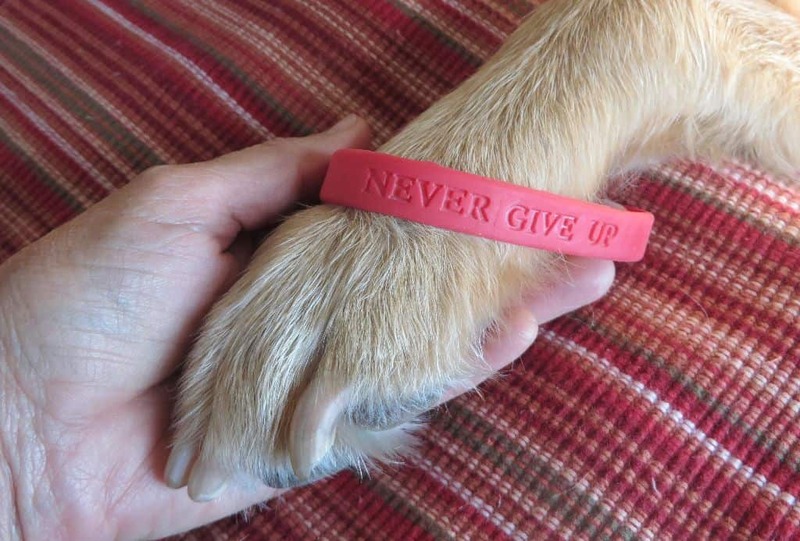 Several medical problems have hit us at once – Rocky has also been struggling the past year. Drawing on the strength my Mother and Father taught me and the support from family, friends and many other compassionate people including my students and you reading this post, we carry on and enjoy each day we are given. Adjusting to and overcoming each new obstacle as it arises. Based on descriptions in “The Stages of Degenerative Myelopathy,” GP is in late mid-stage and has been for the past few months. At this time, her swallowing and breathing are strong, though her bark is altered in pitch and strength. Her bladder and bowel are still under her control. Her front end strength is decreasing but can still mostly support her weight. She is assisted for all walks and potty trips either by her wheelchair or I steady her with a sling. Otherwise she collapses. 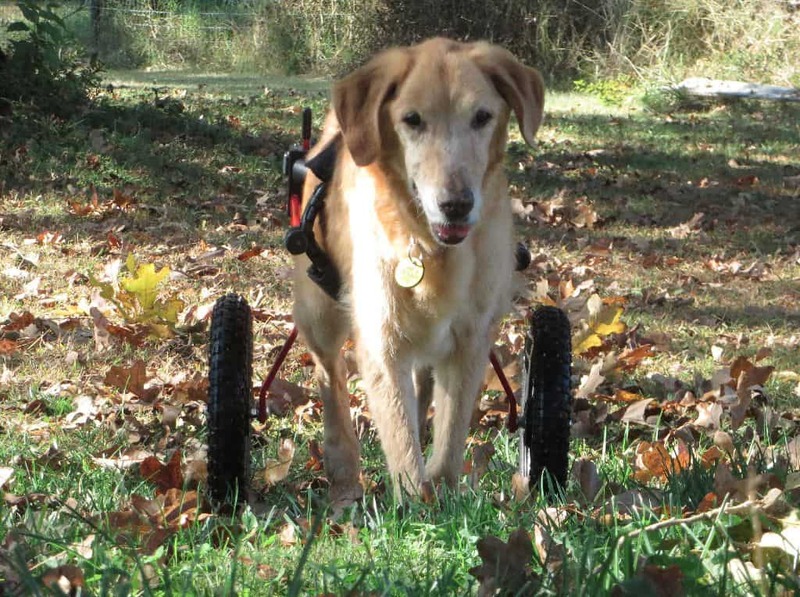 Her rear support wheelchair from K9 Carts continues to be an absolute blessing (!) giving her mobility, exercise, confidence, quality of life. Front wheels will be added soon to provide full support. We’ve had her wheelchair for 9 weeks now and, without it, GP literally would not have life. Thank you, K9 Carts. As with anything shared here or elsewhere, my intention is to spread knowledge, strength and love of life. To remind myself and all to stay present in the moment, enjoy life one day at a time with an eye on the important stuff, and remain ever thankful for our many blessings. Yes, even in time of sorrow. Especially in time of sorrow. Learn more about ALS at the ALS Association’s website. Learn more about DM at Canine Genetic Diseases website. GingerPeach rollin’ into Autumn in her K9 Cart! The truest test of understanding positive reinforcement is your skill using it with one another.